The invention discloses a water soluble alkyd resin solution and water soluble alkyd amino baking finish. The water soluble alkyd amino baking finish takes the water soluble alkyd resin solution as a base material. The water soluble alkyd resin solution comprises the following components by weight percentage: 14 to 18.8 percent of castor oil, 2.3 to 4.4 percent of benzoic acid, 17.3 to 19.5 percent of benzene anhydride, 0 to 6.5 percent of trimellitic anhydride, 3.7 to 5.8 percent of neopentylene glycol, 3.5 to 10.8 percent of dihydroxymethyl propaneoic acid, 8 to 12 percent of pentaerythrite, 9.0 to 11.5 percent of cosolvent, 4.0 to 6.5 percent of neutralizer and 16.5 to 20.0 percent of water. The water soluble alkyd amino baking finish comprises the following components by weight percentage: 35 to 70 percent of water soluble alkyd resin solution, 0 to 30 percent of pigment, 0.2 to 1.5 percent of additive, 10 to 20 percent of amino resin, 0 to 5 percent of cosolvent and 15 to 25 percent of water. 本发明涉及油漆领域，具体涉及一种水溶性醇酸树脂溶液及含有这种水溶性醇酸树脂溶液的水溶性醇酸氨基烘干漆。  The present invention relates to the field of paints, particularly relates to a water-soluble alkyd resin solution and a water-soluble amino alkyd baking paints containing such water-soluble alkyd resin solution. 氨基树脂与醇酸树脂配合制成的氨基烘干涂料，是目前工业涂装领域应用最广泛的涂料之一。  The amino resin with an amino alkyd resin and drying the coating formed, is one of the most widely used in industrial paint coatings art. 它形成的涂膜具有较高的硬度和光泽度、耐酸碱性、耐水性和耐候性均明显优于醇酸涂料，且可流水线作业，施工方便。 It forms a coating film having high hardness and gloss, acid resistance, water resistance and weather resistance are significantly better than alkyd paints, and may be pipeline operations, to facilitate construction. 目前，我国氨基烘干涂料在轻工、家电、汽车和机械等行业均占有重要的位置。  At present, amino drying paint in light industry, household appliances, automobile and machinery industry occupies an important position. 但是，传统的氨基烘干涂料基本上都是溶剂型的，喷涂和烘干过程中大量有毒溶剂的挥发，不仅恶化了操作环境，增加了火灾隐患，还对大气造成了严重的污染。 However, the conventional paint drying amino basically solvent-based coating and drying process a large amount of volatile toxic solvents, not only the deterioration of the operating environment, the fire hazard increases, also caused serious air pollution. 随着全球石油资源的日渐匮乏及各国环保法规的日渐严格，涂料生产厂家与涂料用户对涂料的原料成本及成品涂料的有机挥发物（VOC)含量尤为重视。 With the growing scarcity of global oil resources and increasingly stringent, paint and coatings manufacturer to the user cost of raw materials and finished paint coatings volatile organic compounds (VOC) content of the particular attention of national environmental protection regulations. 因此，在充分满足使用性能的前提下，开发水性烘干涂料来替代它，既节约资源又减轻环境污染、安全不燃，是一种具有广泛市场发展前景的环境友好型涂料。 Therefore, under the premise of fully meet the performance, the development of water-based paints instead of baking it, both to save resources and reduce environmental pollution, safety and non-combustible, is a broad market prospects for the development of environment-friendly paint. 一般而言，水性烘干涂料相比于传统的溶剂型氨基烘干涂料存在如下一些突出的缺陷：由于水的蒸发热很高以及水分的存在会抑制氨基烘干涂料固化反应的进行，所以水性烘干涂料通常所需要的烘干温度较高，一般都需要在150°C以上烘烤15min以上；在烘干固化过程中，随着漆膜中低蒸发热的中和剂、助溶剂的优先挥发、浓度不断降低，致使成膜物质（特别是其中的氨基树脂）在水中的混溶性不断降低，产生一定程度的分相现象，导致漆膜光泽和鲜映性远远不及溶剂型醇酸氨基烘干漆；毒害性较强的乙二醇醚类助溶剂在水性涂料中被普遍应用，有损水性涂料环境友好的特性。  In general, the presence of an aqueous baking coating as compared to conventional solvent-Amino-drying paint as some prominent drawbacks: the presence of water due to the high heat of evaporation of water and drying the coating inhibits the curing reaction of an amino group is , so the higher drying aqueous coatings are typically required drying temperature, generally need to bake more than 15min at 150 ° C; the drying in the curing process, the film with the low heat of evaporation of the neutralizing agent, co priority volatile solvent, the concentration continuously decreases, resulting in film-forming material (in particular amino resins) in water miscibility decreases continuously, a certain degree of phase separation phenomena, resulting in film gloss and DOI far less solvent amino-drying alkyd paint; strong toxic glycol ether cosolvent is widely used in waterborne coatings, waterborne coatings lossy environment-friendly features. 本发明的一个目的是为克服目前水溶性醇酸或聚酯氨基烘干漆固化温度高、时间长以及漆膜的光泽和鲜映性不佳的缺陷，提供一种固化温度低、时间短的水溶性醇酸树脂溶液。  An object of the present invention is to overcome the water-soluble alkyd or polyester lacquer curable amino baking temperature is high, a long time, and the film is poor gloss and distinctness of image defects, to provide a low curing temperature, a short time the water-soluble alkyd resin solution. 本发明的另一个目的是提供一种水溶性醇酸氨基烘干漆，该水溶性醇酸氨基烘干漆以上述水溶性醇酸树脂溶液为基料。  Another object of the present invention is to provide a water-soluble Amino-drying alkyd paints, the water-soluble Amino-drying alkyd paint to the water-soluble alkyd resin solution as binder. 上述原料经如下步骤制备：（1)加入配方量的蓖麻油、苯甲酸、苯酐、偏苯三酸酐、 新戊二醇、二羟甲基丙酸和季戊四醇后升温酯化；(2)升温至160〜175°C不经分水器回流反应1. 0〜1. 5小时；（3)加二甲苯，其加入量为原料总量的3〜6%，升温至175〜180°C保温回流分水1. 5〜2小时；（4)升温至190〜195°C进行回流分水，至酸价小于65mgK0H/ g;(5)蒸出二甲苯，至无溶剂蒸出为止，此时加热温度不能超过198°C ； (6)降温至130°C以下，加入助溶剂稀释至85%的固含量；（7)加入中和剂和水，调固含量为65%、pH为7. 8〜 8. 3，得到水溶性醇酸树脂溶液。  The starting material was prepared by the following steps: (1) the amount of castor oil added to the formulation, benzoic acid, phthalic anhydride, trimellitic anhydride, after neopentyl glycol, dimethylolpropionic acid, pentaerythritol and warmed esterification; (2) warmed to . the reaction was refluxed for 5 hours trap 1. 0~1 160~175 ° C without; (3) of xylene was added, which was added in an amount of 3 ~ 6% of the total raw material heated to 175~180 ° C to reflux insulation trap 1. 5~2 hours; (4) was heated to 190~195 ° C for refluxing, until an acid value of less than 65mgK0H / g; (5) the xylene was distilled off, until no solvent was distilled off, at which point heating temperature must not exceed 198 ° C; (6) cooling to below 130 ° C, is added a co-solvent is diluted to a solids content of 85%; (7) adding a neutralizing agent and water, adjusted to a solids content of 65%, pH of 7.8 ~ 8.3 to obtain a solution of a water-soluble alkyd resin. 所述助溶剂为乙醇、丙二醇甲醚、丁醇、异丙醇中的一种或几种。  The co-solvent is ethanol, propylene glycol methyl ether, butyl alcohol, one or more of isopropanol. 所述中和剂为N，N-二甲基乙醇胺、三乙胺、一乙醇胺中的一种或几种。  The neutralizing agent is N, N- dimethylethanolamine, triethylamine, one or more of monoethanolamine. 研磨上述水溶性醇酸树脂溶液、颜料和助剂至细度< 20微米后加入配方中的其他原料，即得到所述一种水溶性醇酸氨基烘干漆。  The polishing solution of the water-soluble alkyd resin, pigments and additives to a fineness of <20 microns after the addition of other ingredients in the formulation, i.e., to obtain a water-soluble alkyd amino baking the paint. 优选，所述氨基树脂为CYMEL-303氨基树脂。  Preferably, the amino resin is an amino resin CYMEL-303. 所述助剂为分散剂、消泡剂和流平剂中的一种或几种。  The dispersant additives, one or more antifoaming agents and leveling agents. 优选，所述分散剂、消泡剂和流平剂分别为：BI-190分散剂、BYK-020消泡剂、 BYK-307流平剂和BYK-346流平剂。  Preferably, the dispersing agent, a defoaming agent and leveling agent are: BI-190 dispersing agent, BYK-020 defoamer, BYK-307, and a leveling agent, BYK-346 leveling agent. 本发明的有益效果是：1、具低温快干性：上述水溶性醇酸氨基烘干漆的固化条件与其它水溶性氨基烘干漆彡150°C烘烤15min以上的条件相比，本发明产品130°C /15min 的烘烤固化条件显然是一个突破，这一固化要求条件甚至低于传统的溶剂型氨基烘干涂料的固化要求；2、具优良漆膜性能：突出表现在两方面：①机械性能优良：在130°C /15min的烘烤固化条件下，漆膜的机械性能为：硬度> H、附着力1级、柔韧性Imm和冲击强度50cm， 这是其它水溶性醇酸氨基烘干漆目前所无法达到的；②漆膜外观性能优异：60°光泽、 20°光泽/85°光泽的比值，是反映漆膜外观性能的指标。  Advantageous effects of the present invention are: 1, with low-temperature drying of: curing conditions above water-soluble amino alkyd baking paints and other water-soluble amino drying paint San 15min 150 ° C or more compared to the baking conditions baking curing conditions of the present invention product 130 ° C / 15min clearly a breakthrough, the required curing conditions even below the curing requires conventional solvent-amino-drying paint; 2, is excellent in film properties: outstanding performance in two aspects: ① high mechanical properties: baking curing conditions at 130 ° C / 15min, the mechanical properties of the film are: hardness> H, class 1 adhesion, flexibility and impact strength Imm 50cm, which is the other water-soluble amino-drying alkyd paints currently can not be achieved; ② excellent properties film appearance: 60 ° gloss, 20 ° gloss 85 ° gloss ratio / is an indicator of the performance of the film appearance. 其中20°光泽/85°光泽的比值可综合反映漆膜流平性、鲜映性和丰满度程度，比值越高，说明这些性能越好。 Wherein the ratio Gloss 20 ° / 85 ° gloss level may reflect a comprehensive resistance, distinctness of image, and the degree of fullness of the film flow, the higher the ratio, the better the performance. 一般水性氨基烘干漆产品的60°光泽、20°光泽/85°光泽的比值分别为<85和<0.6。 Usually the water-based paint products Amino-drying a 60 ° gloss, 20 ° gloss / 85 ° gloss ratios were <85 and <0.6. 本发明产品的60°光泽、20°光泽/85°光泽的比值分别为>90和>0.6，漆膜的光泽、流平性、鲜映性和丰满度更优，达到了传统的溶剂型氨基烘干涂料的水平。 The product of the present invention, a 60 ° gloss, 20 ° gloss / 85 ° gloss, respectively, a ratio of> 90 and> 0.6, the film gloss, leveling, distinctness of image and fullness better achieve the traditional solvent-amino the level of drying paint. 4调固含量为65%、pH为7. 8〜8. 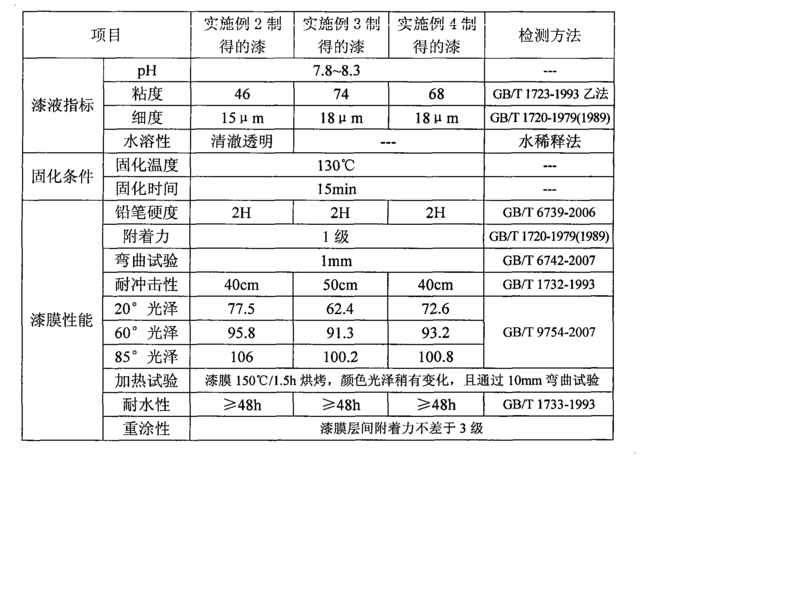 3，得到水溶性醇酸树脂溶液。 4 adjusted solids content of 65%, pH of 7. 8~8. 3, the water-soluble alkyd resin solution was obtained. 混合上述原料即得到所述一种水溶性醇酸氨基烘干漆的清漆。  The mixing of the raw material to obtain a water-soluble amino stoving alkyd varnish. 研磨上述水溶性醇酸树脂溶液、颜料和助剂至细度< 20微米后加入配方中的其他原料，即得到所述一种水溶性醇酸氨基烘干漆的白色亮光漆。  The polishing solution of the water-soluble alkyd resin, pigments and additives to a fineness of <20 microns after the addition of other ingredients in the formulation, i.e., to obtain a water-soluble the amino alkyd baking paints white lacquer. 研磨上述水溶性醇酸树脂溶液、颜料和助剂至细度< 20微米后加入配方中的其他原料，即得到所述一种水溶性醇酸氨基烘干漆的黑色亮光漆。  The polishing solution of the water-soluble alkyd resin, pigments and additives to a fineness of <20 microns after the addition of other ingredients in the formulation, i.e., to obtain a water-soluble alkyd amino baking the black paint varnish. 1. 一种水溶性醇酸树脂溶液，其特征是：其重量百分比组成为：蓖麻油14〜18.8%、 苯甲酸2. 3〜4. 4%、苯酐17. 3〜19. 5%、偏苯三酸酐0〜6. 5%、新戊二醇3. 7〜5. 8%、二羟甲基丙酸3. 5〜10. 8%、季戊四醇8〜12%、助溶剂9.0〜11.5%、中和剂4.0〜6. 5% 和水16. 5 〜20. 0% ；上述原料经如下步骤制备：（1)加入配方量的蓖麻油、苯甲酸、苯酐、偏苯三酸酐、新戊二醇、二羟甲基丙酸和季戊四醇后升温酯化；（¾升温至160〜175°C不经分水器回流反应1. 0〜1. 5小时；（3)加二甲苯，其加入量为原料总量的3〜6%，升温至175〜180°C保温回流分水1. 5〜2小时；(4)升温至190〜195°C进行回流分水，至酸价小于65mgK0H/g ； (5) 蒸出二甲苯，至无溶剂蒸出为止，此时加热温度不能超过198°C ;(6)降温至130°C以下，力口入助溶剂稀释至85%的固含量；(7)加入中和剂和水，调固含量为65%、pH为7. 8〜8. 3， A water-soluble alkyd resin solution, characterized in that: the percentage composition by weight: castor 14~18.8%, 4% acid 2. 3 to 4, 5% 3~19 17. phthalic anhydride, trimellitic anhydride. 0~6. 5%, neopentyl glycol 3. 7~5. 8%, 5 to 10 dimethylolpropionic acid 3 8%, pentaerythritol 8~12%, 9.0~11.5% cosolvent, and . 4.0~6 agent, water and 5% ~ 20 16.5 0%; starting material prepared by the above-described steps of: (1) the amount of castor oil added to the formulation, benzoic acid, phthalic anhydride, trimellitic acid anhydride, neopentylglycol, dimethylol after warming acid and pentaerythritol esterified; (¾ heated to 160~175 ° C the reaction was refluxed for 1. 5 hours 0~1 without a trap;. (3) xylene was added, the total added amount of the starting material 3 ~ 6%, was heated to 175~180 ° C heat refluxing 1. 5~2 hours; (4) was heated to 190~195 ° C for refluxing, until an acid value of less than 65mgK0H / g; (5) steam xylene, solvent-free distilled off, at which point the heating temperature must not exceed 198 ° C; (6) cooling to below 130 ° C, force mouth cosolvent diluted to a solids content of 85%; (7) was added and and water, adjusted to a solids content of 65%, pH of 7. 8~8. 3, 到水溶性醇酸树脂溶液。 To a solution of a water-soluble alkyd resin. 2.根据权利要求1所述的一种水溶性醇酸树脂溶液，其特征是：所述助溶剂为乙醇、丙二醇甲醚、丁醇、异丙醇中的一种或几种。 A water-soluble alkyd resin solution according to claim 1, wherein: said co-solvent is ethanol, propylene glycol methyl ether, butyl alcohol, one or more of isopropanol. 3.根据权利要求1所述的一种水溶性醇酸树脂溶液，其特征是：所述中和剂为N，N-二甲基乙醇胺、三乙胺、一乙醇胺中的一种或几种。 The water-soluble alkyd resin solution according to claim 1, characterized in that: the neutralizing agent is N, N- dimethylethanolamine, triethylamine, one or more of monoethanolamine . 4. 一种水溶性醇酸氨基烘干漆，其特征是：其重量百分比组成为：权利要求1所述的水溶性醇酸树脂溶液35〜70%、颜料0〜30%、助剂0. 2〜1. 5%、氨基树脂10〜20%、助溶剂0〜5%、水15〜25% ；研磨上述水溶性醇酸树脂溶液、颜料和助剂至细度< 20微米后加入配方中的其他原料，即得到所述一种水溶性醇酸氨基烘干漆。 A water-soluble alkyd amino baking paint, characterized in that: the percentage composition by weight: Water-soluble alkyd resin solution according to claim 1 35~70%, 0~30% pigment, 0 adjuvants. . 2~1 5%, 10-20% amino resin,% cosolvent 0~5, 15~25% water; milled water-soluble alkyd resin solution, pigments and additives to a fineness of <20 microns after the addition of formulation other raw materials, i.e., to obtain a water-soluble alkyd amino baking the paint. 5.根据权利要求4所述的一种水溶性醇酸氨基烘干漆，其特征是：所述氨基树脂为CYMEL-303氨基树脂。 A water soluble according to claim amino alkyd baking paints claim 4, characterized in that: the amino resin is an amino resin CYMEL-303. 6.根据权利要求4所述的一种水溶性醇酸氨基烘干漆，其特征是：所述助溶剂为乙醇、 丙二醇甲醚、丁醇、异丙醇中的一种或几种。 A water soluble according to claim amino alkyd baking paints claim 4, characterized in that: the co-solvent is ethanol, propylene glycol methyl ether, butyl alcohol, one or more of isopropanol. 7.根据权利要求4所述的一种水溶性醇酸氨基烘干漆，其特征是：所述助剂为分散剂、 消泡剂和流平剂中的一种或几种。 A water soluble according to claim amino alkyd baking paints claim 4, characterized in that: said dispersant additives, one or more antifoaming agents and leveling agents. 8.根据权利要求7所述的一种水溶性醇酸氨基烘干漆，其特征是：所述分散剂、消泡剂和流平剂分别为：BI-190分散剂、BYK-020消泡剂、BYK-307流平剂和BH46流平剂。 A water soluble according to claim amino alkyd baking paints claim 7, wherein: the dispersing agent, a defoaming agent and leveling agent are: BI-190 dispersing agent, BYK-020 Antifoam agent, BYK-307 BH46 leveling agent and a leveling agent.